So it turns out that The Fastest Red Engine on Sodor was the build up for this. It did so brilliantly, and was a fantastic episode in its own right. 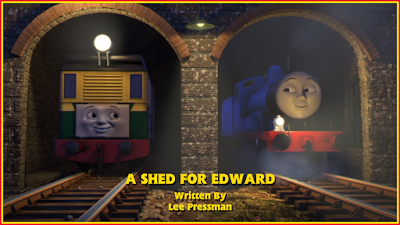 But could the last new episode to air on Channel 5 until Christmas - A Shed for Edward - be as good, if not better? Well, this has caused some controversy..! I'll get to that at a later date; I don't want to bog this review down with fan criticism. I'd rather talk about the episode, because that's the only thing that matters for now. And the episode is absolutely wonderful. The main plot actually feels like The Frozen Turntable done right. Mainly because it's not boring. Every time Edward finds a new place to sleep, we're shown how disruptive the world can be to someone's sleep, rather than denied those situations because Gordon was too proud and arrogant to stay there. Although, it turns out he was right..! I'll be honest, some of the places he "found" to sleep were a bit ridiculous. But I feel that added to the comedy and entertainment value solely because of how absurd it was. It also showed how desperate he was to find a resting place. However, this episode is really special because of the heart and charm that Edward and Philip's dynamic are. It's, by far, one of my favourite dynamics. And the fact that they'll be together more often now makes me incredibly excited. It'll be this generation's Thomas and Edward, and it feels natural for Edward to have a younger engine to mentor. This is where his character will really shine: by passing on his wisdom to another younger character. ...but the best part of it was that it developed wonderfully. Philip instantly understands where he screwed up and does his best to look out for Edward when he falls asleep on the job. It got across the messages really well. Philip learned to be more considerate of Edward's feelings, while kids learned (through Edward) how important sleep is. To be honest, up to that point, the episode was really good. Not really worth top marks, but definitely close. And then the ending scene happened... and that pushed it over the edge to become one of the best episodes of the CG era and the show as a whole. The fact that Thomas was the one to say goodbye was incredibly sweet as we'd been through their journey together two years ago. I'll be honest, I did feel emotional watching it. Some have complained about the ending, but I genuinely don't care about it. First off, Edward left of his own volition because it was closer to his branch line. Secondly, it could really help kids get through similar situations of a friend moving house. You can either be emotional about it (and that's perfectly fine too), or you can look to the future and be excited about living near a new friend. Thomas fans would barely relate to this since a lot of them have no other friends away from the fanbase. It also showcases how much inner strength the engines have. Will the engines miss Edward? Absolutely; there'll probably be an episode focusing on that in the future. But as things stand, he's where he wants to be. And I'm really looking forward to his future episodes (which he will get, no matter what certain fans think). I stand by the opinion that this is the best episode of this series. It could possibly be the best of the show, but I think Edward's Exploit still has the best music and editing. But this one has so much heart and charm, the characters were great, the themes were wonderful and they left things on a positive cliffhanger. As an Edward fan though, I'm delighted that he's going back home. I'm excited for the story opportunities this will bring, and I'm relieved that there's more of a possibility now that he'll never be mischaracterised again. You'll be missed at Tidmouth, old friend. But at least you're where you feel you belong now. I wouldn't give the episode 10/10. But I would give it a decently high score. Edward's better off on his branch line anyhow, he's finally been freed from the 'interchangeable personality setting' that the current Tidmouth line-up brings. The engines feel like they have more wit and charm on their own lines rather than the main. Ryan, Daisy, and the Breakdown Cranes (Judy/Jerome) for instance, feel far more natural than the Tidmouth Seven, and Thomas himself just feels consistent when he's on his own line rather than the 'Local'.